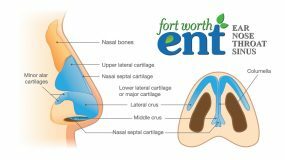 In-office nasal obstruction treatment is performed at Fort Worth ENT and Sinus Center using an advanced state-of-the-art technology called Vivaer®Nasal Airway Remodeling. 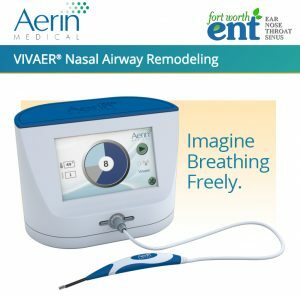 The Vivaer® technology utilizes controlled radiofrequency energy to reshape the nasal tissues inside the nose to improve airflow without requiring any incisions. Now, with the Vivaer® technology, another option is available. 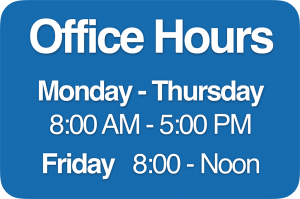 The nasal valve region (which is often times the primary area involved in nasal obstruction) can be opened up during a single, short office visit. The Vivaer® procedure is performed using a local anesthetic and takes approximately 15 minutes to complete, making it a much more convenient option than surgery. For millions of Americans, nasal obstruction seems like a way of life as they live with chronic conditions that block the nasal passages causing congestion and breathing difficulties. When at-home treatments are unsuccessful, nasal surgery may be necessary depending on the cause of the nasal problem. However, for many patients who are diagnosed with nasal valve collapse/stenosis (a common cause of nasal obstruction) Vivaer® in office treatment can be the solution for significantly improving airflow. 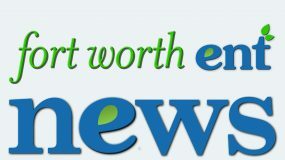 How Does Vivaer® Nasal Airway Remodeling Work? Any weakness or narrowing of the already narrow nasal valve can cause a decrease in airflow and severe congestion, thus difficulty breathing through the nose. Many ENT patients are especially bothered with nasal obstruction while laying down, which can result in excessive snoring, difficulty sleeping, and fatigue. The Vivaer®Nasal Airway Remodeling procedure can help alleviate nasal obstruction by gently reshaping these nasal tissues that are causing the blockage. The procedure begins with a local anesthetic being applied. Next, a small handpiece, or stylus, that delivers radiofrequency energy to the affected nasal valve region is used to change the shape of the area where the nasal cartilage meets the septum. In this way, the valve is permanently opened up, and the airflow is significantly increased, making breathing through the nose much easier. No nasal tissue is removed or destroyed during the procedure. Many patients notice improvement in nasal breathing immediately after the Vivaer® reshaping is completed. Patients in clinical studies also report a dramatic improvement in quality of life similar to those who have undergone more invasive surgical treatments. In other research, nasal obstruction patients who underwent Vivaer® treatment had an average change of -26.9 points (or -41%) in NOSE score tests (nasal obstruction tests). 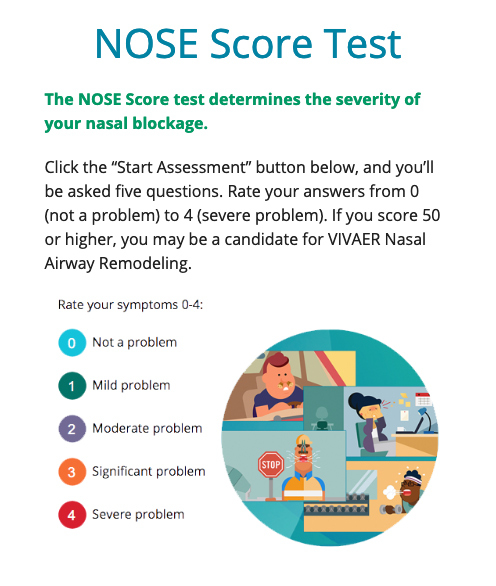 Am I a Candidate for Vivaer® Nasal Airway Remodeling? Patients with chronic nasal obstruction occurring as a result of the shape of the nasal valve can typically be treated with the Vivaer® remodeling procedure. Try this diagnostic self-test to see if you may benefit from Vivaer®. Cottle’s Manuever: With one or two fingertips placed on the cheeks on either side of the nose, press gently and pull outward to temporarily open the nasal valve. 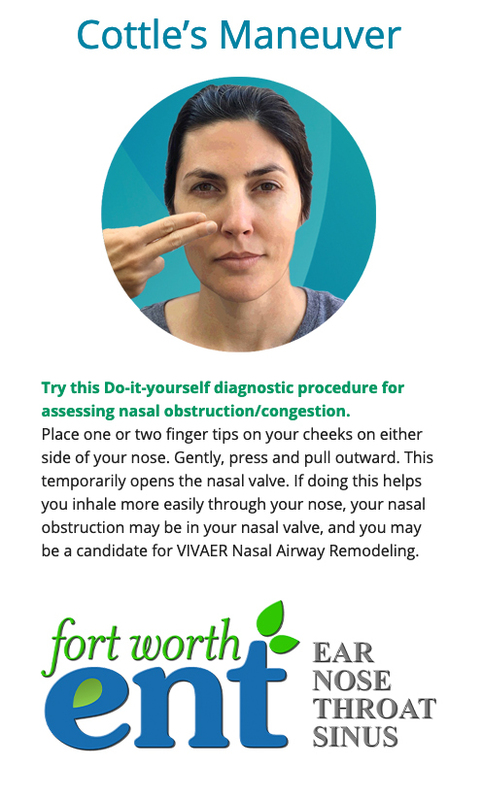 If you can inhale through your nose more easily by doing this, then the nasal obstruction may be in your nasal valve, and you may very likely be a good candidate for the Vivaer® procedure. Researchers estimate that over 2/3 of total nasal airflow resistance cases involve the nasal valve area. That is great news for a large group of nasal obstruction sufferers who can now get relief with Vivaer® Nasal Airway Remodeling. If you are experiencing nasal passage obstruction and would like to find out more about the non-invasive, in-office Vivaer® Nasal Airway Remodeling treatment, please contact the otolaryngologists at Fort Worth ENT and Sinus Center for a consultation.